Which, looks like nothing. 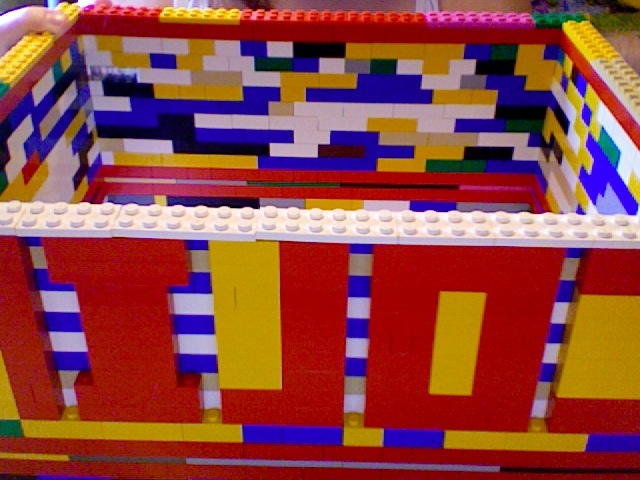 But it is going to be a box for cards, made completely out of legos, for my brothers High School Graduation Open House. He used to love playing with legos, I thought it would be fun and unique. I didn't think it would be that hard to put together. Boy was I wrong. The 10x12x6 in structure I have thus far took a solid 2+ hours this morning. Awesome! But isn't life like that sometimes? It's harder than it looks. We can't just throw it together. Sometimes it may seem easy, but there are times when we must go slow, be careful. My brother's name is part of the wall on one side of the box. I used a certain color for the letters, and had to find certain sizes to get it to look how I wanted on the box. Just like in life we choose certain clothes to wear, things to do, certain things to say, a particular way we want to portray ourselves to o. We have a picture in mind of what our lives will look like, just like I have a picture of what I want the box to look like when it's completed. That doesn't mean each piece is going to fit exactly right. I have needed to find smaller pieces to fill a hole. There have been people in my life who may fit in one exact spot, but couldn't fit anywhere else. There was a childhood friend who didn't make it to my adult life. A college friend that didn't last past graduation. A family member who floats in and out of my life. I have has to use ugly colors in the box because there was nothing else to use. Just as there have been ugly times in my life. But they are surrounded by good. By beauty. By love. They blend into the box of my life. Memories there to serve as reminders but not there to dominate over the big picture. Then there are the pieces that hold us in place. Like the white border on the top front of the box. My beliefs. My values. They have held true for so long that if I lost those I think my box would seem incomplete. Little pieces of me would fall out. We build our lives piece by careful piece. Sometimes complete demolition of an area is necessary. An overhaul of your outlook on life. A complete separation from a certain person in your life. A move to a new area so you can build anew. Each of our boxes will be different. For instance, I love blue and would prefer lots of blue in my box. While my little brother really likes the color red. I am an organized, detail oriented person and would want my box to have a pattern, some order to it. My mom is not like that at all. She would just have pieces thrown together. My brother has autism and would need his box to stay the same. One of my very good friends is a take life as it comes person, she doesn't mind change. Her box would change directions, it wouldn't need to be an exact square. Every box is made of lego pieces. But they are all just a little different. That's what makes life interesting. That's what makes life great. Remember the sunset. Live your life. Love your life. As much and as best you can. What a beautiful post, Heather! I love the way you compare each lego piece to another aspect of life... And it's such a precious thing you are doing for your brother! This is such a good post. :-) I love life lessons in little or everyday things. That box is a great idea! Well, I hope you don't mind...I nominated you for another award! The theme of it made me think of your writings.